EASTLEIGH’S budding star Luke Beebe (picture left) had four reasons to be cheerful after a remarkable two days on the green baize. A third successive tournament win on the Cuestars South of England Under-21 Bronze Tour circuit virtually secured the 12-year-old a first regional title. Beebe overcame fellow Chandler’s Ford Snooker Club member Connor Benzey 2-0 in the final of the sixth leg at Jesters Snooker Hall, Swindon. Making only his second appearance on the tour, Benzey, the 12-year-old son of the 2001 Southampton Town Champion Mark Benzey, lost the second frame on the black after leading by 40 points. Beebe, now 30 points ahead of second-placed Ollie Gibbs (Gosport), is hot favourite to claim the rankings title with two events to play in Fareham, next month, and Salisbury, in May. 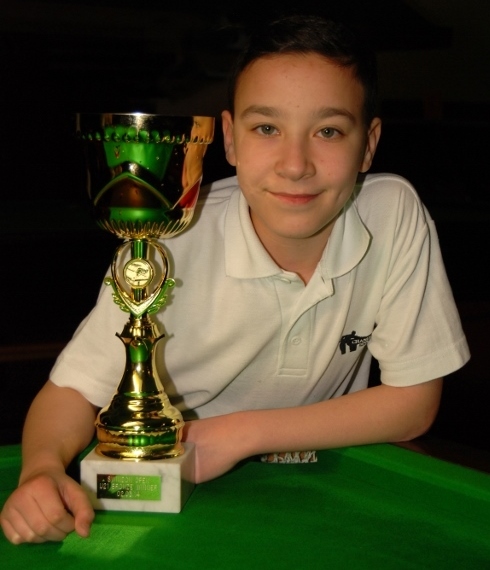 The previous day, he defeated defending champion Mickey Joyce (Basingstoke) on a re-spotted black to win the one frame needed to clinch a third Eastleigh & District Under-13 Premier crown. Two hours later, he secured runners-up spot in the Under-18 Premier on frames won behind runaway champion Austen Petty. And in the afternoon, the Crestwood College pupil cued up for the biggest pay day of his two-year career. Beebe pocketed £250 for finishing top of the 26-week Open Series at his home club. “It was a good day,” admitted the youngster, who is now targeting a fourth Under-13 title before his 13th birthday in July. Elsewhere, Lee Fitzpatrick (Totton Recreation Club) reached his second semi-final in only his second Cuestars appearance, losing 2-0 to Beebe. Former rankings leader Ollie Gibbs (Stoke SC, Gosport), winner of two legs this season, was unlucky to lose out on second place in his group after a three-way black-ball play-off with Keegan Reed (Salisbury SC) and Sam Warren (Chandler’s Ford SC). Harry Cook (Woking SC) reached the knockout for the first time in his fourth appearance on the circuit but went out 2-0 to Benzey. And many congratulations must also go to Adam Cowdroy, younger brother of Silver Tour player Bradley. Adam (Greenbaize, Bournemouth) qualified for the knockout for the first time in six outings since making his Bronze debut at Salisbury SC on October 6, 2013. He recorded great wins in his group against Kaine Petty (Salisbury SC) and Ben Tillison (Copnor SC, Portsmouth) to finish behind Beebe but went out 2-1 to leg-two winner Ed James (Woking SC). Adam is now tenth in the rankings. The seventh leg of eight is at Fareham Snooker Club on Sunday, April 6. ROUND-ROBIN GROUP A: 1st, Connor Benzey (Chandler’s Ford SC); 2nd, Callum McDonald (Salisbury SC); 3rd, Liam Ashman (Player’s, Westbury); 4th, Ben Hatch (Southampton); 5th, Connor Shaw (Greenbaize, Bournemouth). ROUND-ROBIN GROUP B: 1st, Edward James (Woking SC); 2nd, Sam Warren (Chandler’s Ford SC); 3rd, Keegan Reed (Salisbury SC); 4th, Ollie Gibbs (Stoke SC, Gosport). ROUND-ROBIN GROUP C: 1st, Luke Beebe (Chandler’s Ford SC); 2nd, Adam Cowdroy (Greenbaize, Bournemouth); 3rd, Kaine Petty (Salisbury SC); 4th, Ben Tillison (Copnor SC, Portsmouth). ROUND-ROBIN GROUP D: 1st, Lee Fitzpatrick (Totton Recreation Club); 2nd, Harry Cook (Woking SC); 3rd, Nat Kidner (Greenbaize, Bournemouth); 4th, Ally Pollard (Salisbury SC). QUARTER-FINALS (12 points): Benzey beat Cook 2-0, James beat Cowdroy 2-1, Beebe beat Warren 2-0, Fitzpatrick beat McDonald 2-1. SEMI-FINALS (15 points): Beebe beat Fitzpatrick 2-0, Benzey beat James 2-1. LAST-16: Canberk Benning (Jesters, Swindon) beat Liam Ashman (Player’s, Westbury), Cameron Holt (Liberal Club, High Wycombe) beat Kaine Petty (Salisbury SC), Ollie Gibbs (Stoke SC, Gosport) beat Ben Tillison (Copnor SC, Portsmouth), Bradley Leishman (Stoke SC, Gosport) beat Ally Pollard (Salisbury SC), Nat Kidner (Greenbaize, Bournemouth) beat Ben Hatch (Southampton), Keegan Reed (Salisbury SC) beat Connor Shaw (Greenbaize, Bournemouth). QUARTER-FINALS: Holt beat Benning, James Budd (Stoke SC, Gosport) beat Gibbs, Callum Browne (Player’s, Westbury) beat Leishman, Kidner beat Reed. SEMI-FINALS: Holt beat Budd, Browne beat Kidner. FINAL: Browne beat Holt 2-1.